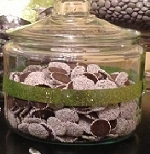 Candy Jars are apart of the lifeline that keeps any sweet shop or store progressive and remaining profitable. Whether you choose glass product bins, the unbreakable plastic exhibiting containers, or the ever popular acrylic confectionery bins, your store will surely benefit from the nostalgia they awaken within your customers. Include our clear containers for parties like birthdays, family picnic's or on your customer appreciation day's. Selections of candy is profitable when you advertise in the right type of store fixtures. 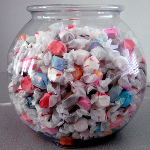 Old fashioned candy containers, such as the penny candy jar, evoke feelings of days gone by. From the counter-top to the table-top, showcase your sweetest treats in a nostalgic candy container. Acrylic containers with a lid helps to keep your merchandise fresh from germs and other outside unwanted hitchhikers. Include our Straight-Top Acrylic Container with lid. They come in six different sizes for your choosing. There is sure to be a size that best fits your needs. Want to go the cheaper route? Come and see our plastic candy boxes, bowls and more. Plastic is best to be used when you know little hands will be dispensing their own sweet treat or your event is being held outdoors. Glass product containers come in all shapes and sizes, with or without lids. Material such as glass adds a little more elegance to your sweet buffets or frozen dessert toppings. They are the perfect decorations for college graduation events along with weddings and other special occasions with sophistication. Wholesale candy is available in many colors, shapes, sizes and designs and the best way to increase sales is to make sure all those fun sweets can be easily viewed. Design a candy shop that is profitable and will attract more clientele. Decorate with profits in mind by selecting the perfect choice that best fits your needs. Don't forget to include materials like the accessories for dispersing such as a scoop, favor containers for special occasions and more. 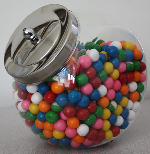 For the self-serve types of candy, make it easier to obtain your bulk candy and keep customers coming back for more. Offer food dispensers filled with candy or other bulk dry goods at your home or in the office for all to enjoy. Increasing profits can be only a click away, take a chance on adding more patrons to your retail store by purchasing your candy jars today!